Come and join us, celebrate the end of summer! Once again, Villa Bloem will be throwing an end-of-summer-fiësta right on our own doorstep! Everyone is welcome this SATURDAY SEPTEMBER 8TH starting 20:00. This year we’ll be partying SPANISH STYLE, we’re bringing sangria, musica y mucho más! ENTRANCE FREE! Wonderful Spanish-inspired food by Butifarra for only €10,-! 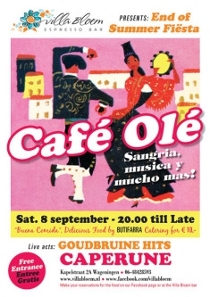 Swingin’ live music by Caperune and some classic Dutch-Spanish hit songs performed by the girls known as El Céro.